Often, I am asked to bring a dessert or something to a party, being that I have a website, I feel some pressure in trying to find innovate and great tasting dishes. I will admit to I have a great pleasure when I bring a dish, the dish comes home empty. I was in a panic on Thursday night, I had to bring a chocolate inspired dessert, and I was lacking inspiration. A friend of mine mentioned Chocolate Pistachio Bundt Cake, that she had it growing up. This Chocolate Pistachio Bundt Cake is easy to make, a boxed cake mix, a box of pudding, chocolate syrup are the main ingredients, I put this cake together in less than 10 minutes, and I have to say this Chocolate Pistachio Bundt Cake was a winner. I brought home an empty dish, with people asking me for the recipe. Looking for a dessert to impress? Give this very easy to put together Chocolate Pistachio Bundt Cake. This cake is pretty on the inside with the way the chocolate swirls around in the pistachio layer. ix with a hand mixer for approximately 2 minutes, blend until smooth, scrape the bowl down occasionally while mixing the cake. Remove 1 cup of cake batter and place in a small bowl, add 1/2 cup chocolate syrup to the 1 cup of cake mix. Stir the chocolate syrup mixture until the color is uniform. Place yellow cake mix batter into bundt cake pan, and then pour the chocolate syrup mixture on top of the yellow cake mix in the bundt cake pan. Using a knife, gently swirl the chocolate and yellow cake mix batters together, do not over stir, you want to have definite marbling. Bake cake in the oven for approximately 55 minutes, you will know the cake is done when a toothpick is inserted it will come out clean. 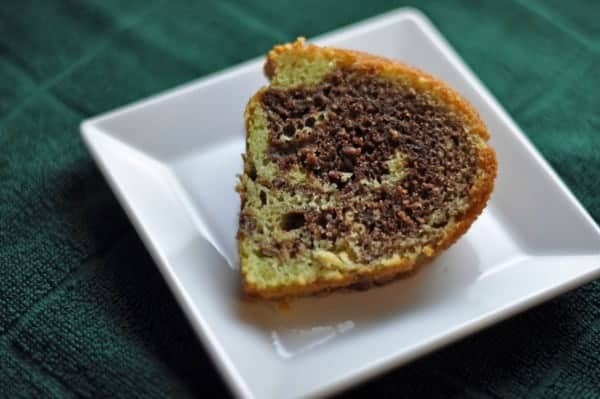 I didn't serve my chocolate pistachio bundt cake with any icing, I don't think it needs it, this is a very moist cake that has a wonderful nutty chocolate flavor. Next time I make this cake I am going to use the Hershey's Dark Chocolate Syrup. I have always used Orange Juice instead of the water. When I have seen this recipe elsewhere, it calls for sugar, but I notice that you do not have it listed as an ingredient. Any reason for that? Just trying to decide whether to include it in my cake or not. THanks! The cake is very sweet as it is, you have a cake mix with sugar, and then the chocolate syrup also contains sugar. I do not feel it was necessary. The cake mixes are no longer 18 oz boxes. The Duncan Hines is 16.5 oz. I have made this for years and today the center was all soggy–Never had that happen in 35 years! Ugh, when did they switch? I know that this was posted a long time ago but I just found it to verify if the pudding was instant. I just wanted to mentioned that the recipe I found of my mom’s had a half cup of orange juice and then a half cup of water. I think it makes it more moist. Also I have never swirled the chocolate in. Just pour it on the top and it ends up int the middle of the cake. Yes, you can you instant. My mom made this all the time, she would pour half of the cake mix then pour a hole can (guessing 8oz) of Hershey’s in the center then pour the rest of the cake mix on top. She didn’t mix the Hershey’s, just bake it till it’s ready checking with a long toothpick. She had a metal pick 10″ long with a red ring at the end to grasp with thumb and index made for baking. I meant to type the word bowl, I made a typo. Thank you for noticing I will make the correction to the recipe. I love this cake! I drizzled some thin icing over the top and sprinkled on some roasted pecans. Also, to make it more like my moms, I only marbled by sticking a spatula in at different intervals. Now, stop reading the comments and go make this cake! Just like Mom made! Thank you for posting this! Do you think if you ground up some pistachios in the blender or food processor it would work to give it a more pistachio flavor? or would it just mess things up? I think that would work very well. I would most likely hand chop a few and see how it goes. This looks really good. You know it is really nice to not always have to make things from scratch! A good box mix is not a bad thing. Thanks for this recipe! Thank you sooo much for this recipe! My mom would make this cake every year for my birthday when I was growing up. It was my favorite! I never knew how she made it, but it was so moist and delicious. After she died 15 years ago, I tried to figure out how to duplicate it on my own but never had any success. I was just resigned to the reality that the secret died with her. Now, I can make this for my children, and they can taste for themselves this awesome cake I’ve been telling them about for years. Again, thank you, from the bottom of my heart! Thanks so much for the lovely compliment. This recipe was suggested to me by someone else. These types of recipes are the best, the evoke such memories. My mom always made this for coffee hour at church when we were kids. I haven’t had it ages, thanks for reminding me! It’s YUMMY! Making this cake for a bake sale. Never tried it before, so we will see…..but it sounded great! I’m making this one for Mother’s Day for sure. That looks great! My mother used to make a similar cake, with a pistachio-pudding-based frosting. We have a favorite, which was shared by someone at work, called Quick and Easy Double Choclate Chip Cookies. Recipe may have come from the box 😀 but it’s so easy we can’t resist. All you need is 1 box of Duncan Hines Chocolate flavored cake mix, 1 stick margarine melted (1/2 cup), a 12 oz bag of chocolate chips, and 2 eggs. Preheat oven to 350, Mix cake mix, margarine and eggs together in a bowl, stir in the bag of chocolate chips. Drop by spoonfuls on greased cookie sheet. Bake approximately 12 – 15 minutes, depending on whether you like them soft or crunchy. Remove and cool. It makes about 30 cookies. You can use half thawed orange juice and some water to make your cup instead of using all water. Use some of the orange juice, oleo, Confectionery sugar to make an icing. This is for frosting not to pour over hot cake. I bet that is very tasty.